Beaverhead Ranch is headquarters for both Beaverhead Outfitters and Beaverhead Outdoors Real Estate. 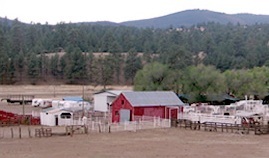 Owned and operated by the Diamond family, Beaverhead is a working cattle ranch covering over 120 square miles in the heart of the Gila National Forest, New Mexico. Beaverhead Lodge has been an important landmark since the days of the Old West and the land remains relatively undisturbed from the days of Geronimo. Today Beaverhead still remains one of the most remote locations in the entire Southwest.